Brand New: Melbourne, One Heart Too Many? Melbourne, One Heart Too Many? 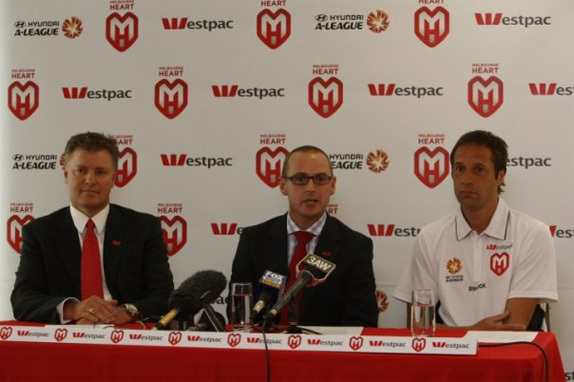 Melbourne Heart FC is a soccer team that will begin competing in the A-League during the upcoming 2010/11 season, and, until recently, lacked a concrete name and identity. Soccer has a strange place within Australian sporting culture. In spite of the relative success of our national team at the last World Cup, and the increase in popularity with the introduction of the A-League in 2004, the world game has always been the bridesmaid to the brides of the other (more successful) Australian football codes. Melbourne, in particular, is a hard place for new team to succeed — with 9 out of 16 AFL teams, and highly successfully rugby and soccer teams — any new sports franchise that enters into such a saturated market has to hit the ground running. With that in mind, the Melbourne Heart identity does a lot right. And a few things… less right. While we are often (rightly) quick to dismiss crowd sourcing as a blight upon the design industry, I think that when it comes to local sports teams we can make an exception — if anything is meant to represent a grass roots community, local teams are it. Local tabloid the Herald Sun ran a competition to name the new team. From four choices — Melbourne Heart FC, Sporting Melbourne FC, Melburnians, and Melbourne Revolution — shortlisted after the competition, Heart won. However, the name has been mired in opposition by two entities: First, the Australian Football League (AFL) which claimed that the only team capable of using the words “Australian,” “Football,” and “Club” was the city’s rugby team, Melbourne Football Club. The second came from the Lord Mayor’s Charitable Foundation, which holds an annual “Heart of Melbourne Appeal” for the homeless. It remains to be seen whether this name and identity will stick around for long. The logo itself, created by brand agency Elmwood, is bold and iconic, and offers a neat visual representation of the name. The colour is quite nice and the gradients actually work pretty well, although reproducing them on a kit could be difficult. The shield motif is appropriate, and references a long tradition of other soccer teams, while still managing to look contemporary. It seems that a large part of the design was focused around creating a rivalry with the other local club, Melbourne Victory — thus the choice of colour to imply a red vs. blue dynamic. However, trying to integrate the shield and heart, while also avoiding heart-shaped visual clichés, has led to a slightly clunky solution — there’s none of that soccer elegance. The use of the large “M” to signify Melbourne is getting a little old, too. Surely there are better ways of representing our fine city? Additionally, the attempt to meld together “M” and “H” into a single form defined by counterspace doesn’t work — the H actually ends up being a pair of rugby goalposts. Not to mention the weird little dongle… thing. The choice of Gotham for the logotype seems very fashionable now, but I wonder, given the popularity of the typeface, how long it will remain that way. The logo in press conference action. Way to work the red and white palette guys! Image source. Overall, this is an identity that seeks to integrate itself firmly with the community as quickly as it can, and as far as football club identities go, this is far from the worst out there. But as an isolated piece, it doesn’t work as well as it could. Thanks to Jo-Ryan Salazar for the tip. Chris Thorpe is a freelance graphic designer in Melbourne, Australia. He blogs at Convert to Shape and Twitters under the same name. He is an international correspondent for Brand New.